"Nice for casual get togethers." In a large bowl, cream together shortening and peanut butter; gradually add sugar and brown sugar, creaming well. Beat in the egg and vanilla. Sift together dry ingredients and add to creamy mixture. Shape dough into balls, using a rounded teaspoon for each ball. Roll balls in sugar and place on a greased cookie sheet. Bake at 350 degrees for 10 minutes. Remove from oven. 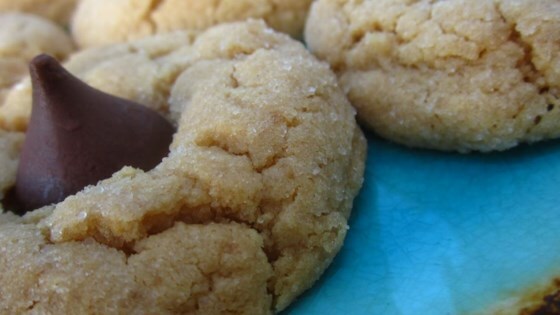 Top each cookie with a candy kiss, pressing down firmly so cookie cracks around edges. Put back into oven for 2 to 5 minutes longer, until golden brown. I've made these cookies before and they're great! I added extra peanut butter for more flavor. A sure fire hit for get togethers! This recipe works really well if you cut the flour to 1 1/3 cups. It makes about 32 cookies, so you will need more kisses. Every time I make these the kisses melt. What do I do. They are my favorite cookie. Just can't get the kisses to stay up.